Aether Fest #1, Festival of International Radio Art, June 6-27, The Harwood Art Center, Albuquerque, New Mexico. During the 1930s, motion lamps were commonly displayed on top or near home radios as a visual accompaniment while listening to the radio. Motion lamps use the heat generated by a light bulb to turn a patterned cylinder of paper. The image appears to move due to the changing light from the moving cylinder. In this piece, the image is an animated forest fire produced by the "Scene-In-Motion Corporation" in 1931. In this piece, the lamp's historical role as a visual accompaniment to an unrelated auditory experience is transformed into the central focus of a unified audio visual scene. 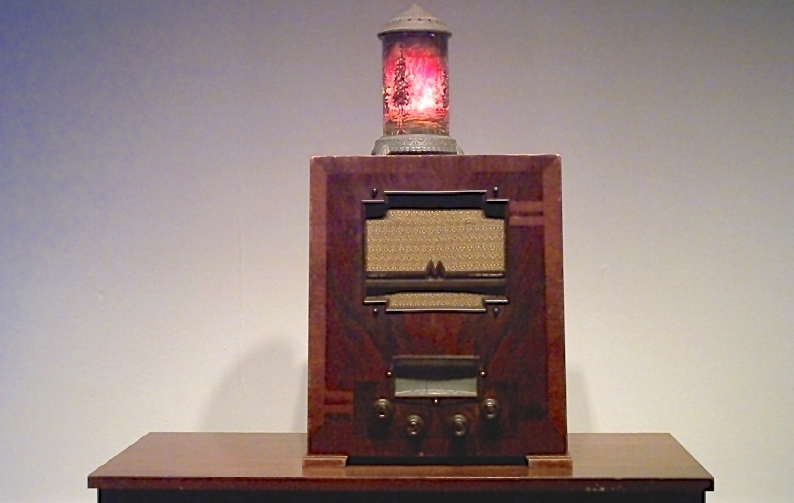 A radio broadcasts a mixture of radio static and the sound of the forest fire, completing the scene suggested by the lamp. The radio broadcast highlights the moving image while the visual image reinforces the sonic broadcast. This change of roles allows us to reconsider the relationship of image and sound in our present media. Listen to a sample of Fireside Broadcast.